We were approached, by Compass, to deliver a bar offering that helped strengthen the re-branding of the World 7’s Tournament. The brief was simple, great looking units that were in-keeping with the new ‘street-food’ feel of the fan village but ones that were still capable of servicing the demands of 50,000 people in the fan village. 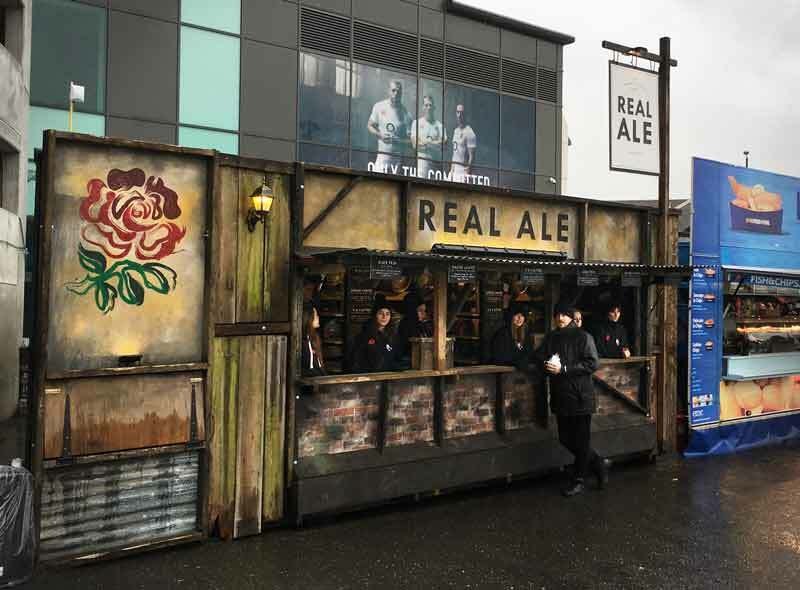 For this event, we designed and delivered the first dedicated ‘Real Ale’ bar at Twickenham Stadium. We served over 6,000 pints of cask ale in one weekend from this new 7 meter unit. Complimenting the real-ale bar was a separate unit delivering main stream draught products that was in keeping with the street-food branding of the event. As a result of this weekend, we are now a permanent fixture for all England International games at Twickenham Stadium. For the past 2 years Twickenham have asked us to deliver and operate all the pitch-side bars for concerts staged there under extremely restrictive conditions. Originally, Part of the Promoters’ and Twickenham’s brief, was to serve draught beer (no PET) for the first time to better the customer experience; Since we started we have dispensed 100,000 pints for international acts such as U2, Eminem and The Rolling Stones.